Setting new standards worldwide: The enormous 500 lb capacity of the Seca 700 mechanical beam medical scale makes it possible to weigh even heavy or obese patients effortlessly. And the incomparably fine 1/8 lb graduation guarantees very accurate results - an indispensable factor, expecially when weighing children and dialysis patients. The Seca 700 is well thought out right down to the smallest detail. Easy to operate and simple to read. Featuring the famous Seca quality and the unbeatable price:performance ration. 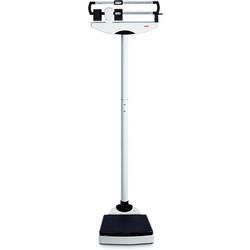 The included measuring rod converts the scale into a complete space-saving measuring and weighing device. Now includes casters / wheel set for easy transport.